This recipe is packed full of flavor. 1. Heat a heavy large saucepan over medium-high heat. 2. Add sausage, onion and garlic and sautÃ© until sausage is cooked through, breaking up meat as it cooks. 3. Add the tomatoes with its juices. 4. Simmer until sauce slightly thickens, stirring occasionally, about 10 to 15 minutes. 5. Preheat oven to 375 F.
6. Stir in the pesto to the sauce. 7. Season the sauce with salt and pepper to taste. 8. Lightly oil a 13 x 9-inch baking dish. 9. 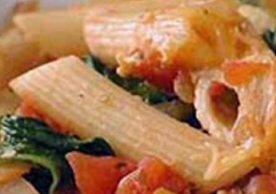 In a large bowl, combine pasta, spinach, mozzarella, 1/2 cup Parmesan and stir in tomato sauce to bowl. 10. Transfer mixture to prepared baking dish. 11. Sprinkle remaining 1/2 cup of Parmesan over the top. 12. Bake about 30 to 40 minutes or until it is bubbly and the cheese has melted. 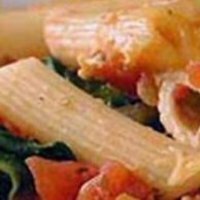 The best baked ziti ever! Plant Based Eating - Woooo whooo!